As part of their French and art history studies, on October 18, Westminster's 7th-grade students ventured to the Phillips Collection in Washington, DC. There, they learned more about French artists from the Impressionist period, and viewed for themselves some of the great paintings in this style. The students enjoyed several hands-on activities. They pretended that they were characters in a Renoir painting and acted out what they would be doing in the next moment. The students analyzed why certain paintings were presented in the same room, and also created their own Impressionist sketches. Nora, a 7th-grader, commented, "It was very interesting to see the paintings, and even the architecture of the building. We didn't get to see the entire collection, but I will probably go back with my family to see the rest of the paintings. It also helped that Mme O'Neil explained Renoir's painting, 'The Boating Party.' We were able to make comments about the painting and answer the docent's questions." "Field trips are recognized as important moments in learning; a shared social experience that provides the opportunity for students to encounter and explore novel things in an authentic setting (caise Informal Science web site)." Their importance is supported by professional organizations such as the National Science Teachers Association, which asserts that field trips can “deepen and enhance” classroom study (NSTA 1999), and by independent researchers, such as Salmi (2003), Falk & Dierking (1997), and Wolins, Jensen, & Ulzheimer (1992) who found that field trips are experiences that can be recalled and useful long after a visit. 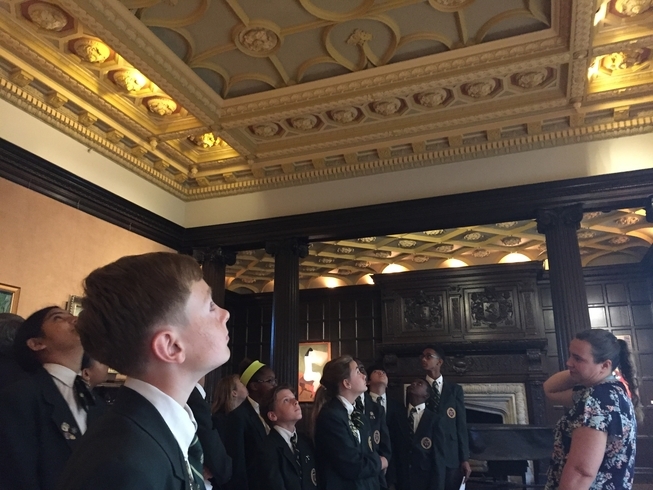 The trip to the Phillips Collection is one of several that the 7th-graders will take this year as part of Westminster's rich field-trip program. The school strongly supports the idea that students learn best from direct experience of what they are studying. The wide variety of field trips also introduces children to the cultural richness of the greater Washington area and gives them practice in appropriate behavior in a variety of sophisticated venues.